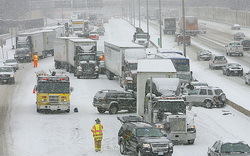 Please view the Winter Weather Preparedness series to ensure you are ready for the winter! We recently published a series of articles from the National Weather Service as part of Colorado’s Winter Weather Preparedness Week. We have now made those stories easier to find by adding them to the Weather Education menu on the left of every page. This entry was posted on Sunday, November 9th, 2008 at 7:49am MDT and is filed under Colorado Weather, Thornton Weather. You can follow any responses to this entry through the RSS 2.0 feed. You can skip to the end and leave a response. Pinging is currently not allowed.